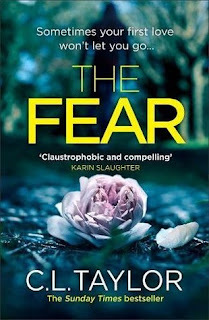 The Fear is absolutely excellent, a twisting thriller which is quiet different (in the best of ways) from what I have come to expect from the author. I could not put it down and read it in a single sitting. Lou Smith is used to being headline news as, aged seventeen, she ran away with her 37-year-old teacher, Mike, during a short-lived affair. Now 32, Lou’s life is in tatters – and she resolves to return home to confront Mike for the damage he has caused. But she soon finds that Mike is unchanged, and is now grooming a young 15-year-old girl called Chloe. I'm thrilled to be able to share an extract from The Fear by CL Taylor. This is from pretty early on in the book and gives a glimpse into the character of Wendy. Wendy stiffens as two young men glance her way as they walk into the café. Her preferred table, a single-seater in the window, was occupied when she came in and she had no choice but to take a four-seater in the corner. It’s a quarter past one and the café is filling up. Sooner or later someone’s going to ask if they can share her table. What if Louise Wandsworth herself took one of the seats opposite her? Wendy’s stomach clenches with a mixture of fear and excitement. But there’s no sign of her. When Lou came into the café yesterday just after one, she went straight up to the counter and ordered a black coffee, a chicken roll and a tub of fruit salad. Wendy watched discreetly from behind her paperwork as Lou frowned over her mobile phone and picked at her food. It was the first time she’d seen Lou up close and she was dumbstruck. It reminded her of the evening she’d been having drinks in the Royal Malvern hotel with Angela when Michael Ball had walked in. Wendy had raised a hand, waved and flashed him a smile. Michael Ball didn’t even acknowledge her. Instead his gaze swivelled across the room, to a large, raucous group of lovies by the bar. Wendy was mortified. Angela told her that she wasn’t the first person to mistake a celebrity for a friend but Wendy insisted they leave immediately. It had been the same when she’d first seen Lou – the surprise and the hollowing in her stomach – only that time she’d managed to grip the table rather than thrusting her arm into the air.